Today, I'm adding Indian flavors to your summer-inspired Sunny Salad Bowl, with my Indian-staple, easy Tandoori Chicken Salad!! 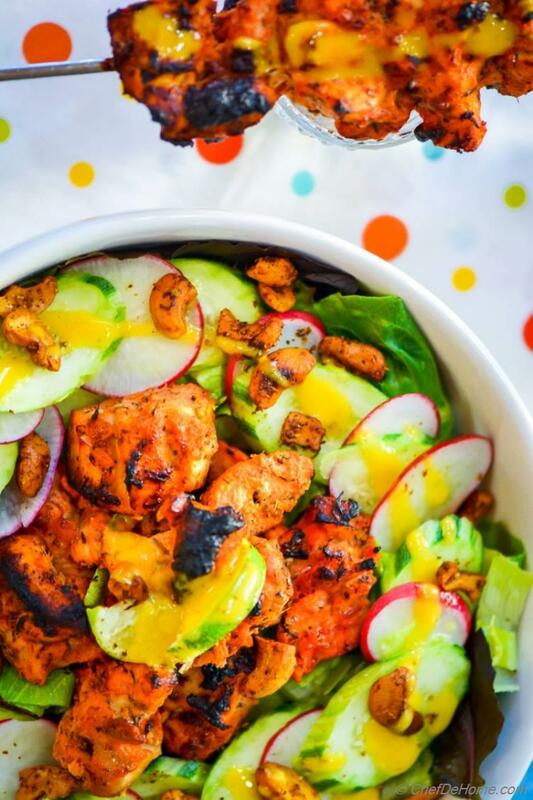 Charred to perfection tandoori chicken marinated in homemade Indian Tandoori Marinade with cooling sweet-and-sour mango dressing, crunchy cucumber and radish, and nutty crunchy of curry-lime cashew nuts..... this Tandoori Chicken Salad will be your new favorite summer salad!! We are addicted to eating Tandoori Chicken with Naan for dinner! During summers, however, to keep dinner lite, I often make Tandoori Chicken and serve topped on a salad instead of rice or bread. This keeps dinner lite, yet packed with flavor, low in carbs, and also gluten free. First time I served Tandoori Chicken salad, it was so so well received by my carnivore-family that it has made a definite place in my summer-salad menu. In-fact, these days, even when I grill Tandoori Chicken for elaborate Indian Meal with naan, rice and raita....... I keep a portion of chicken, to pack salad, for lunch the next day! Speaking of which, I must tell you that this salad can also be made with your Indian-takeout leftovers!!! How good does that sound? 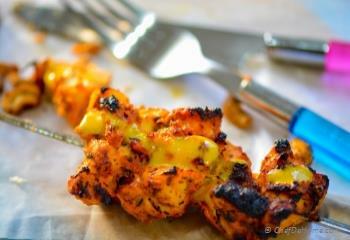 Most of my tandoori dishes are cooked straight on Gas Burner, in broiler, or on the gas grill in summers. Few weeks back, we went to Indian Market to buy some Indian spices. To my surprise, I found most vendors selling custom-made small Indian Tandoors (clay ovens)! It was so exciting to see Tandoor. I really would have bought one if we were not living in a tiny apartment. :) (perks of apartment living...) But... for now, I'm pretty happy with grilling or direct stove-flame cooking to get that high-heat taste of Tandoor. For this recipe, I have grilled the marinated chicken on gas grill. However, recipe also includes instructions to broil the chicken. Indian Tandoor is a very high-heat vessel just like Italian Pizza Oven. So, whenever you planning to have that traditional charred taste of high-heat Tandoor, it is good to use a direct heat source like grill, or broiler. 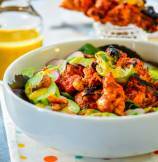 This Tandoori Chicken Salad is perfect for BBQ or backyard dinner parties. Chicken marinated a day in advance will develop lots of flavor from tangy and spicy marinade of yogurt and Indian spices. Mango dressing will easily stay good in refrigerator for 3-4 days. 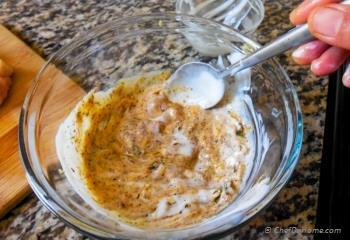 For summer grilling parties, I often marinade chicken a day in advance and make the dressing as well. Just before grilling, skew the chicken into metal skewers and throw on grill. Serve salad and dressings on the side. PS: If you serve grilled naan bread with it, Tandoori Chicken Salad will be a substantial main course salad. This kind of easy, hearty yet simple salads make me very happy when I'm not in mood to cook a lot. Really, other than processing mango-yogurt to make dressing and marinade for chicken, there is not much to do. Once chicken goes on grill or in the oven, it takes care of itself. 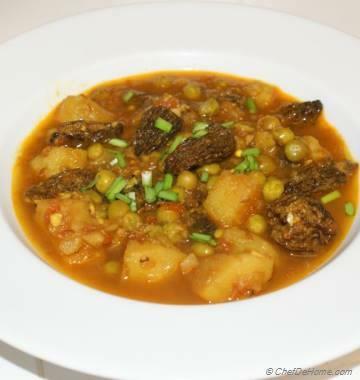 In meantime, chop veggies, and you are ready for delicious, healthy, and flavorful dinner!! 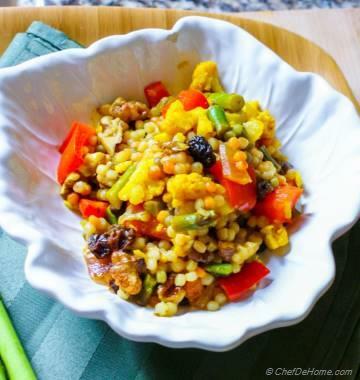 Curry Lime Cashew really give an additional layer of flavor to this salad. However, you can also use roasted and salted Cashew, instead of curry-lime flavored. Smart Swap Replace chicken with Tofu or Indian Paneer for a vegetarian salad! 1. 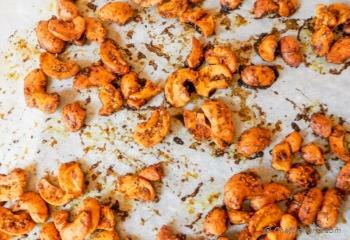 Make spice rubbed cashews for crunch - lime juice, curry powder, salt, black pepper, oil - roast for 10 minutes at 400 F.
2. 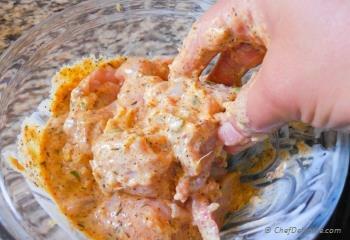 To marinate chicken, mix all ingredients for chicken marinade into a medium size bowl. 3. Add cubed, bone-less chicken and coat well to combine. Cover the bowl, refrigerate, and let it marinate overnight, or at-least for an hour. Let the marinade, flavor the chicken, for at-least 1 hr. 4. To grill tandoori chicken, preheat grill. Skew pieces of chicken in metal skewers, and then grill chicken for 10-12 minutes (on high), turn upside-down after 4-5 minutes, cook until charred and fully cooked through. You can also broil chicken in oven: Broil chicken for 16 minutes, turn upside-down after 8 minutes, broil until charred and fully cooked through. 5. To make the dressing, in a food processor, combine yogurt, mango puree (or pulp, if using whole mangoes), lime juice, and sugar, pulse until smooth. Add 1-2 tbsp water if consistency is too thick. Adjust salt per taste. 6. In salad bowl, arrange lettuce, romaine, sliced radish and cucumber, top with chicken, roasted cashews. Serve dressing on side. Pour generous amount over salad just before serving. Enjoy!! Farin, thanks my friend! I'm glad you like it. 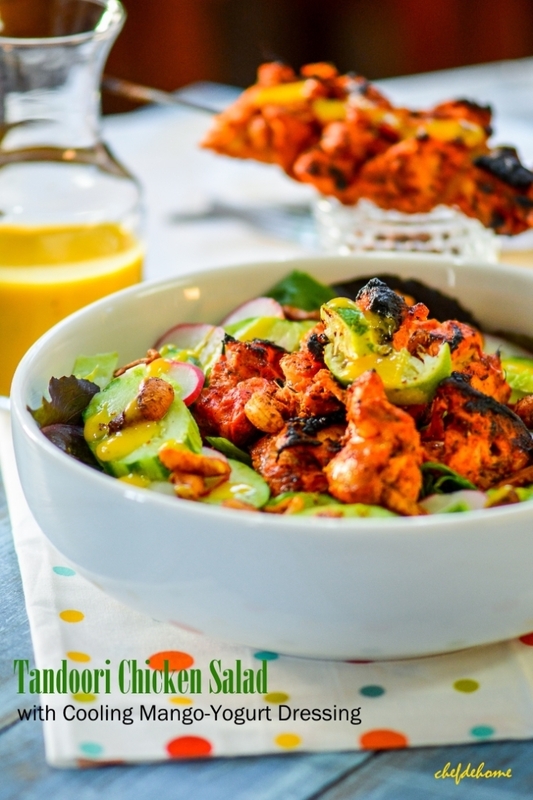 I love Tandoori Chicken and this salad is perfect for me... looks delicious! Thanks, Tasha! I hope you get chance to try it sometime. I ran across your recipe on Google+ - completely delicious looking salad! 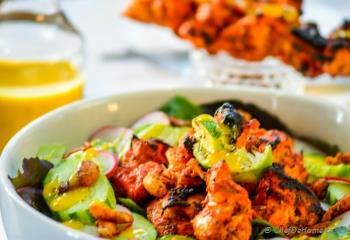 Kristi, I'm so pleased you like look of this Tandoori Chicken Salad. Trust me, it tastes equally delicious too! thank you so much for stopping by and taking time to write to me. I appreciate that! This is my kind of dinner! I love big dinner salads with some tasty chicken or fish on top. I'll definitely be making this. Thanks, Kristen. I hope you like when you try. Beautiful salad Savita! Love the flavors and the chicken! Pinning! thanks, Mira! I'm glad you like it. 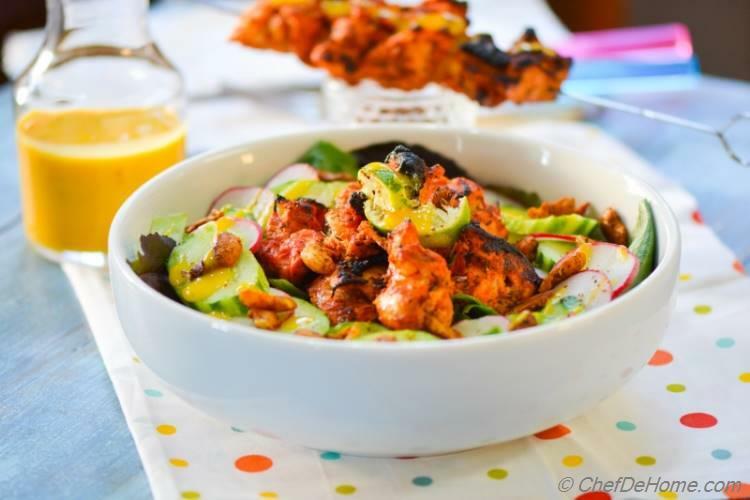 Indian Tandoori Chicken Salad looks fabulous Savita! Loving all the awesome flavors here, and that Mango-Yogurt Dressing is just to die for! This bowl is simply gorgeous, delicious and super YUM. You took my heart away with this recipe! It looks sooooo good and the cashews add to the perfection of it!! Puneet, thanks a lot for kind words. It's one scrumptious bowl, after digging into it I am sure I won't want any other dish.Truly a gorgeous bowl with the superlative tandoori chicken pieces,crisp salad greens,topped with crackling zesty nuts,all lapped up in a silky mango dressing,can one ask for more? Piyali, thanks my friend for taking time to write such magical words! I appreciate it! I love finding salad recipes like this - ones that are unique and so flavorful! I used to not like salad very much and would always make them in the most BORING ways (Romain, cucumbers, carrots, ranch), so now that I am a bigger salad fan, I love finding interesting ones to make! 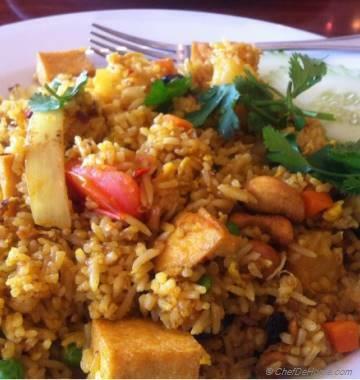 It looks so beautiful and super delicious dear Savita . Loved the roasted cashews and the marinate recipe alot. WOW! Kushi, thanks a lot my friend! Savita that chicken salad looks so so good!! I love tandoori chicken so I know I will enjoy this! Ami, thanks, my friend! I'm sure you will like it.